Leading Manufacturer of combo pack of micronutrient for soil application, bt cotton special, mirconutrient mixture fertilizer for cotton crop and micronutrient mixture fertilizer for pulse crop from Nashik. SUGARCANE-POWER is a Combo Pack of essential Micronutrients required for healthy growth of Sugarcane. Application of Sugarcane Power results in almost 20 to 40% increase in yield & more Sugar recovery. SUGARCANE-POWER application provides Zinc, Iron, Manganese, Boron, Magnesium, Sulphur & Silica to the crop. These elements are essential for healthy growth, more tillers, early maturityand increases weight of canes etc. SUGARCANE-POWERapplication helps to increases,pest &disease tolerance which reduces the cost of spraying pesticides, thus crop remain healthy. SUGARCANE-POWER will help to reduce the pH of the alkaline soils which in turn will help increased availability of all other nutrients. 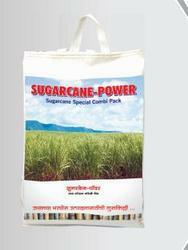 53Kg Sugarcane combo pack contains. Soil Application :- Apply whole combo pack of 53 Kg for one acre of crop either in single application @ planting time or two split doses, second at the time of first earthing up. Compatibility :-Do not mix SUGARCANE-POWER with Phosphaticfertilizers. 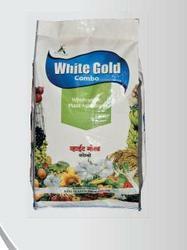 WHITE GOLD is a Combo pack of Essential Micronutrients required for healthy growth of crops like Cotton, Vegetables, Turmeric, Ginger, Onion etc. Application of white Gold results in almost 20 to 40% increase in yield & better quality produce. WHITE GOLD application provides Zinc, Iron, Boron, Magnesium, Sulphur& Silica to the crop. These elements are essential for healthy growth, profuse flowering, increased shelf life of the produce etc. WHIE GOLD application helps to increase pest & disease tolerance which reduces the cost of spraying pesticide & crop remains healthy. WHITE GOLD will help to reduce the pH of alkaline soils which in turn will help increased availability of nutrients. WHITE GOLD contains balanced micronutrients for both irrigated &non irrigated farming, suitable for direct, soil application.Can be used in Vegetables, Ginger, Turmeric, Onion, Potato, etc. Rainfed Crops:- 27 Kg per 2 acre. Compatibility :- Do not mix WHITE GOLD with Phosphaticfertilizers. 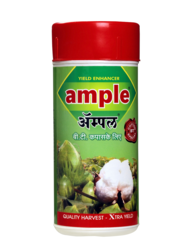 Amino acids and short term peptides required for healthy growth of plants.ample is an amino acid based bio stimulant specially formulated to enhance the yield & quality of cotton, fruit crops,vegetables etc. Application of ample results in almost 20 to 40% increase over normal yield and increase in staple length & uniform boll size of cotton. ample is derived from vegetable origin sources, hence it is non poisonous and non hazardous ample is eco friendly. ample helps to increase pest & disease tolerance which reduces cost of spraying pesticides & crop remain healthy. Dilute 200 to 500 ml of ample in sufficient quantity of water for spray per acre. 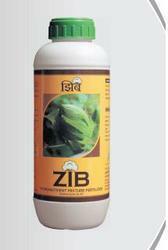 Spray during early vegetative growth stage, flowering stage & fruit development stage. (Three Spray required). Compatibility :- ample is compatible with almost all pesticides except those with alkaline in nature. Do not mix with Copper / Sulfur compounds. 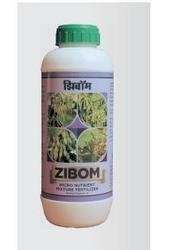 Spray during early vegetative growth, flowering & fruit development stages. Looking for CROP SPECIAL ?